Anyone know if the Collins mentioned on this item means the Collins radio people? I saved this little item from going into a dumpster a few years ago because I thought it was kinda old and neat. Never saw it before, but looks like the type style I have seen of Collins equipment before. If it dates back to WW2/Korean War era, it could likely be Collins Radio. Just an idea, but the Collins HF radio antenna couplers in the Marine CH-46 helicopters had to be pressurized internally. Seem to remember it was 5 psi. To prevent internal arc-over at altitude if I'm remembering all this right. Had Schrader valves on them, and maybe Collins had this made for their field techs. to check pressure? Same antenna coupler was used on other Navy/Marine aircraft. Interesting ideas for sure. It would be neat if this was field tech item. However, would it have the word "customer service" on a military item? I wondered at first if it might have been some kind of give away to Collins customers who bought something. I may also check on ARF and see what those chaps can tell me. My guess is Collins Radio, just from the description of "Around the World around the Clock"
Collins Radio did make a lot of radio gear for the Military, I think they made a lot of the Boat Anchors such as the Proverbial R390. Whilst working at the Long Beach Naval Shipyard in the late 60's and 70's there were a lot of tuners and couplers that were pressurized, the ones I worked on were filled with Nitrogen gas, I don't remember the pressure but I think it was about 20-30 PSI. This was to prevent salt air contamination. And since it was Nitrogen it had no Moisture and that prevented condensation inside the couplers and tuners even in cold weather. Boy I sure replaced a ton of Neoprene gaskets. We used Dow Corning grease to help seat and seal those gaskets. I never saw that type of pressure gauge used, so I think it was a sales promo gift. We used calibrated Dial pressure gages for accuracy. The one you show isn't accurate or reliable on consistent readings. They were probably given out as tire pressure gages. However the couplers did use the automobile and bicycle type of stems to fill them with. Top end, they used silver wire for the coil and notice the sliding shorting ring to tune. This is the bottom with the drive motor assembly, there were two geared bars that had notches to prevent over travel and roller micro switches that detected the detents to stop travel and of course the motor was DC to allow travel up and down. I -think- I can remember seeing some article on a certain type of coax that had to be pressurized also, now that I can think about it. I worked for Collins for 33 years and don't remember ever seeing anything like this. I've also asked a few colleagues of mine and none remember seeing it either. That doesn't mean it's not from Collins Radio, but we don't recall seeing it. The color scheme and font appear to be like something you might find in the old Collins Radio days though. 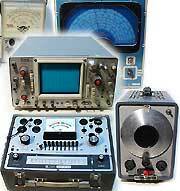 It was Rockwell Collins by the time I started there in 1976.